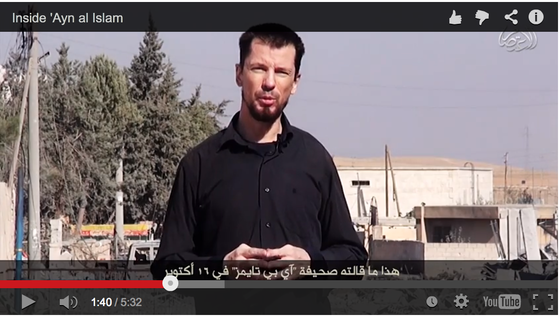 Update: The Islamic State video of John Cantlie in Kobane, which was included above, has been removed from YouTube. It has been replaced with an image from the video. The Islamic State has released a video featuring John Cantlie, a British war reporter who has been held hostage since 2012, in what is claimed to be the Syrian border town of Kobane. An image of Cantlie from the video can be seen above. The US and its coalition partners have launched a number of airstrikes against the Islamic State’s forces in and around the town. And Kurdish forces are battling the jihadists on the ground. Western and Kurdish sources have claimed in the press that they have pushed back the Islamic State’s advances. But Abu Bakr al Baghdadi’s organization uses Cantlie to say this is not the case. In the 5 minute, 32 second video, titled “Inside ‘Ayn Al-Islam,” Cantlie appears to be stationed somewhere in Kobane during broad daylight. At one point he points to the Turkish flag in the distance. Cantlie is made to say, contrary to the claims made by UK and US officials, that the Islamic State’s “mujahideen” are near victory. The jihadists are “definitely not on the run,” and all Cantlie can see around him are the group’s mujahideen — not their Kurdish opponents. The video begins with an aerial shot supposedly taken by the “Drone of the Islamic State Army.” The aerial footage shows a town that has been ravaged by warfare. The PKK, as it is known, is the Kurdistan Workers Party, which is fighting against the Islamic State’s guerrilla forces. The PKK has been designated a foreign terrorist organization by the US government. Despite the American airstrikes, Cantlie is made to say that “the mujahideen have pushed deep into the heart of the city” and are controlling the eastern and southern sectors. Cantlie then briefly looks around, noting that he can’t see any Western journalists. He cites a number of accounts in the Western media, and quotes US officials, before dismissing them. “There are no journalists here in the city, so the media are getting their information from Kurdish commanders and White House press secretaries, neither of whom have the slightest intention of telling the truth of what’s happening here on the ground,” Cantlie says. He claims that because the coalition’s airstrikes have prevented the Islamic State from using its heavy artillery, the group has adjusted and is using lighter armaments, moving from house to house. It is for this reason, the Islamic State has Cantlie say, that the bombings are not enough to defeat the jihadist group in Kobane or elsewhere. The Islamic State also has Cantlie mock the US, noting its “hopeless” Air Force has resupplied the mujahideen by dropping two crates of weapons to the group. Cantlie is referencing recent footage showing crates of weapons, which were intended for the Kurdish People’s Protection Units (YPG), but mistakenly dropped into the Islamic State’s hands. The YPG is the Syrian branch of the PKK. Cantlie concludes by saying that the battle for Kobane is “coming to an end,” as the Islamic State is “mopping up” now in the streets. The Islamic State’s video of Cantlie is a propaganda device, and is intended to undermine Western claims about the efficacy of the airstrikes. The fog of war makes any clear-eyed assessment of the situation difficult. Eventually, both Foley and Cantlie became the Islamic State’s hostages. Those who don’t know, Ayn-Al Islam (Spring of Islam) is the term ISIS calls Kobane. The Turks and the Syrian government calls the town as Ayn-Al Arab (Arab Spring). Interestingly John Cantlie calls the town Kobane, despite ISIS preferring the name “Ayn-Al Islam”. Also that structure which has the Turkish flag on top is in fact in Kobane and not in Turkey itself. Why it has a Turkish flag and not an ISIS or the YPG flag is a bit of a mystery. ISIS seems to have forgotten to translate that image of that structure in English on 0:21 of the video. Thanks to an Arabic speaker, the video at 0:21 translates as “Turkish Wheat Silos”, a place where they make wheat. Strangely it is located in Kobane and is not in Turkey itself. Why the YPG or ISIS have not touched the Turkish flag is a bit of a mystery. Rhetoric from whitehouse/pentagon doesn’t seem to match online media. What’s with the peshmerga supplying artillery support only for the kobani front? That makes no sense at all. At a minimum, isis has a decent pr campaign. I believe The US administration has painted itself into a corner on this one. I would love to hear what’s really being said by the professionals in our armed services! This is disgusting. The only solace to be taken from this is that they might keep him alive long enough for an escape or rescue. Furthermore they (ISIS) are full of crap, they’ve been humiliated by the YPG and the PKK and are now compensating by using their victim as a mouth piece. I really hope the PKK and the Turkish government can make peace so that they can focus on the real problem of ISIS. I know the PKK has done bad things in the past, but they’ve changed and they and the YPG need and deserve our (the United States and the West) aid. No question Kobani may fall. However IS is a truck army. 2000-3500 trucks etc that require gasoline to operate (10-30 gallons a day per truck, 20,000-60,000 gallons a day, all over Syria and Iraq.) As refineries and their micro refineries are taken out gasoline becomes a real issue, as it did for Germany in WW2. One can assume the coalition can manage 40-50 trucks a week (200-300 month), logisitics will prevent these guys from holding very much very long. Kobani will be very much a Pyrrhic victory not just in losses of man power but logisical support. The Kurds can fight their way into Turkey and escape slaughter, only to return a week later- IS will never be able to hold Kobani without attacking Turkey. If IS can not stop drones from 24/7 observation and aerial smart bomb targeting of logistical support, they will be destroyed within six months. While there are better approaches, Obama’s campaign against their logistical support will probably work- just not very dramatic-not shock and awe- one 500 lb’er at a time..
Kobane will be the graveyard of ISIS. They can keep pouring troops in, they will be bombed to dust. They may take it, but it may break them also. Yours is one the most optimistic posts I have seen. The optimism is not unwarranted. During the Iraq war there was smuggling not necessarily by Al Qaeda but by various groups (clans) that smuggled cars out of Iraq to Saudi Arabia. Potentially, if ISIS has the cash they could encourage smuggling of stole vehicles from Turkey perhaps Saudi Arabia into ISIS territory to make up losses. The Pentagon has acknowledged its oil campaign has been a failure. They can’t hit the oil wells themselves and the main facilities because that risks too much enviromental damage, and the micro refineries are local owned businesses that provide gas to local businesses not IS. So we haven’t affected IS cash flow at all. We did piss off local oil workers who lost their only livelyhood. Obama has already lost this war because he is not willing to go all in while IS will never surrender. I notice Mr Cantlie wasn’t wearing his orange shirt and pants as he has been dressed in in every video of him so far released. IMO the video would have been much more effective if he had been dressed in his obvious orange shirt and pants. I am assuming the threat of detection from the air caused them to go with the black button down. The video clip shown first from the air is a scene of complete devastation. Looking at google earth is it possible to easily identify this first shot. Very near the center of town but towards towards the turkish side. It appears to me that Kobani is destroyed. Contradictory Claims have been made and now it matters what happens to Kobani.